MeetD: Dating apps for singles is an app, which is totally free and which will help you to flirt online, find a partner and meet new people nearby. In MeetD (MeetDating) you will find a detailed analysis of the best free dating apps and dating sites currently available, so that you know which apps to use for finding single women and single men. Furthermore, we will show you a lot of techniques and give you tips how to flirt fast, in addition to a love calculator to know the compatibility with your possible soulmate. Nowadays, there are a lot of apps or free dating sites that promise you to find love, but very few do actually work and allow you to get dates with women and men or easily meet people nearby. What will you find in the app MeetD: Dating apps for singles? ♥ Our team is dedicated to find and analyze the best free online dating apps. 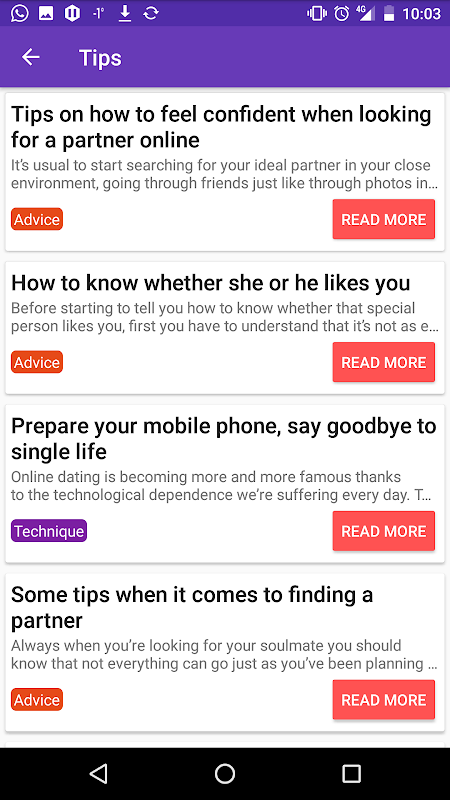 In this app we will show you the apps that work best, so that you don't have to try out useless apps or apps that don't help you to have dates with women and men. ♥ We offer you a selection of the best techniques, tips, advices and tricks to flirt online, elaborated by our experts, which will help you succeed on your dates with unmarried women or flirts. We will also explain you what is the speed dating and how you can meet people in your first dates. ♥ You will find a section with phrases to find a partner and seduce her/him, as well as the funniest compliments for those moments when you lack inspiration. ♥ If you want to know whether your romance, friendship, relations or encounters will have a happy end or not, we have prepared a love calculator, which will tell you if you are a perfect match. What do the dating apps you can find in MeetD: Dating apps for singles offer? Usually, these kinds of apps to meet people have the following features: - Chat with girls and boys in your city. Some of them offer the possibility to make video calls or video live chat. - Flirt, send photos, establish friendships, etc. - See who has visited your profile - Rate profiles of other people and comment on their photos. We are sure you have a lot of questions like: - I am looking for a girlfriend: Which is the best Spanish chat for free? How do I flirt trustworthily on the Internet? - Which are the best apps to meet people? Which are the best ones to hook up quickly? Are you tired of reading ads like “woman seeking man” or “girl seeking boy” that don't work out in the end? Therefore, we have decided to help you by developing this app. Don't wait any longer, download MeetD now if you are looking for adventures and new people nearby and enjoy the best dating apps. If you miss any dating app, send us your suggestions! We would be pleased to analyze more apps or include more tips and tricks on how to find a partner or fling. Last but not least, if you liked our app, we would greatly appreciate if you could give our app a positive review. 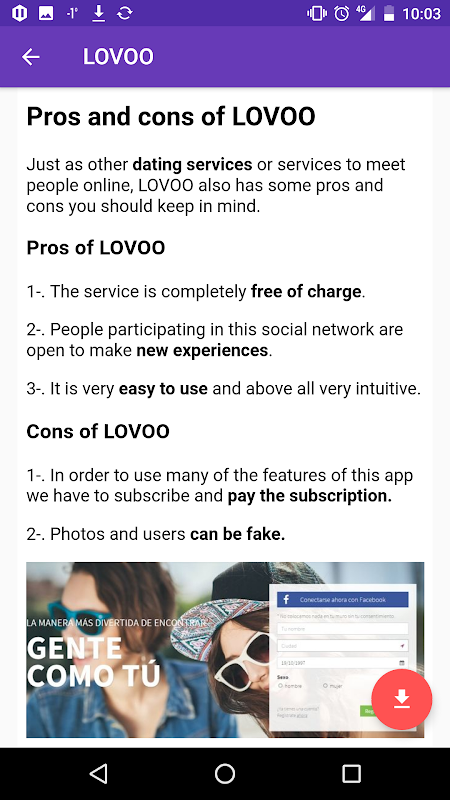 This will help us to keep maintaining the app, to keep analyzing more apps, to keep on adding tips and all in all, it will allow us to continue to help you flirting and meeting your perfect partner. If there is something you don't like about the app or you think that could be improved, please let us know and we will fix it, but please, don't give us a negative review. Note: This app is not a dating app. 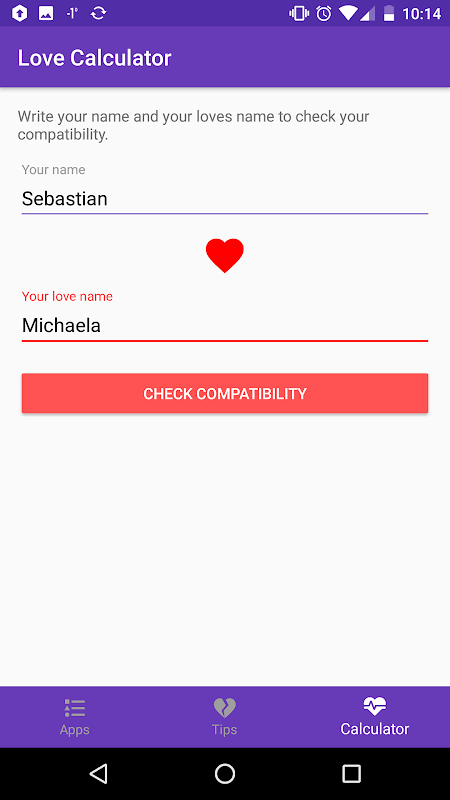 It is an app, which contains various sections, which will help the user to find a relationship. 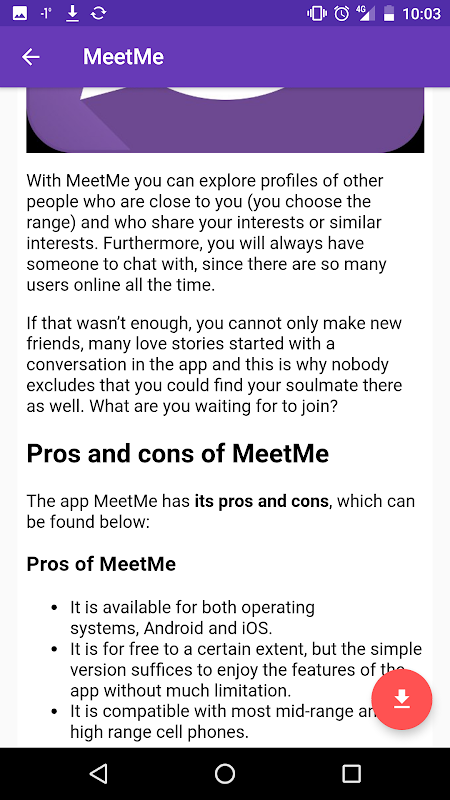 MeetD is a guide with the best dating apps (with a detailed analysis), tips, techniques, tricks and a love calculator to help you find a partner. 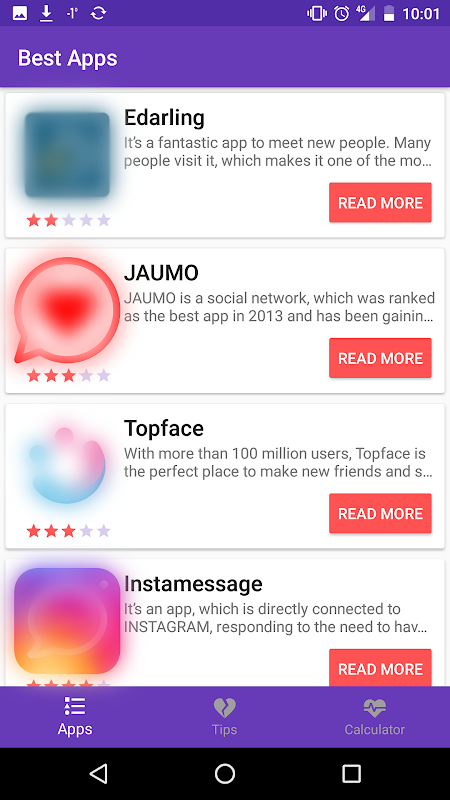 All images and designs found in this app have been created by “Free Dating Apps, Chat & Social Apps”, which is commercially prohibited the use of the content that is in this program without prior consent of the developer.  Is MeetD: Dating apps for singles yours? Claim it!